The sandwich maker is one kitchen gadget that comes in handy for making a quick breakfast toastie, packing a snack for lunch or just making up something for the kids to nibble on before the main meal appears. Here’s a simple egg tuna toastie to start our sandwich maker toastie recipes with. If you don’t have one, go get it in any of the shops (click on the sidebar links to buy from Konga, AmazonUK, AmazonUS or EBay). 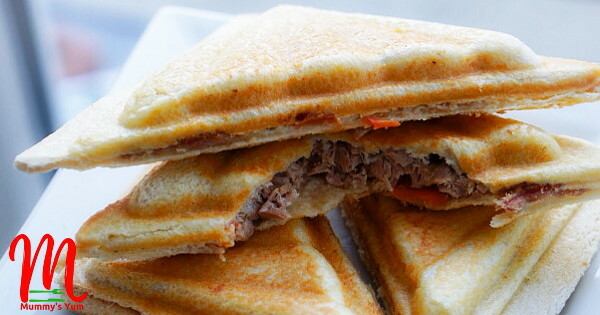 A deep-fill sandwich maker is the best because it allows you to add more fillings. Making sandwiches is another way to ensure the kids get good nutrition from their meals. With the sandwich maker, it is easier for toddlers to eat as the filling is sealed within the bread and stops or reduces spillage and mess. Break eggs into a bowl and whisk well. Drain and add the tuna, tomatoes, onions and salt or seasoning into the egg, then mix well. Switch on the sandwich maker. Spread butter on one side of the bread slice and place the buttered side on the sandwich maker. Scoop the tuna mix on the bread making sure you don’t spread too near to the edges to avoid it leaking out. Cook till the light goes off on your sandwich maker (about 2-3 minutes maximum). Allow to cool before serving with tea, pap, porridge or any drink. Substitute cheese for egg in this recipe. Cheddar cheese is a good one. Grate the cheese with the small side of your grater and stir in the fish and other ingredients before toasting. Cheese is a very good source of calcium for strong bone and teeth formation.